We can help you with all of your oven repair needs. Our company does professional appliance repair on all brands and models of appliances. It does not matter if your appliance is old or new we will find the right solution for your problems. For example, we work on Asko, Bertazonni, Bosch, Dacor, DCS, Electrolux, Fisher&Paykel, Frigidaire, GE, Jenn-Air, KitchenAid, La Cornue, LG, Liebherr, Marvel, Miele, Perlick, Samsung, Siemens, Sub-Zero, Thermador, Traulsen, True, Viking, Whirlpool, Wolf and many more. Our technicians are all factory trained and certified. They will be able to diagnose your oven issues accurately and find the right parts and professionally install them. Customer satisfaction guaranteed! If your oven’s temperature is too high or too low, if broiling element is not functioning, the timer is broken we can help. Our company fixes the variety of ovens every day. Some ovens are easy to fix. Just one look from our experienced technical expert and your oven will be as good as new. But sometimes your oven will need more complicated repair job. This concerns newer models with computers inside and with digital systems. Often parts are worn down and will need to be replaced. Our technicians are always on top of the latest technology in appliance repair. They will be happy to help you in any way possible. Besides helpful, diligent and detail oriented team we also offer you excellent customer service. Our technicians are always on time. We have a flexible scheduling. That means we will be able to schedule you for a weekend or an afternoon if this is more convenient for you. Also, we offer FREE service call with any repair and FREE and accurate estimate. We try to stick to our estimate no matter what. That is why our prices are some of the best in the industry. You get a professional service at very reasonable rates. 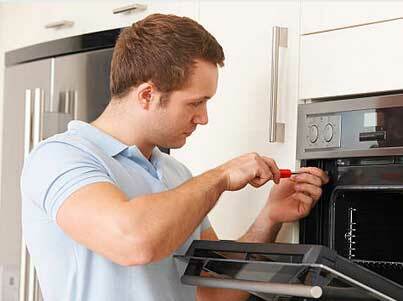 Oregon Appliance Repair does oven repair as well as other appliance repair services. Our company has more than 30 years of experience. We are family owned, and family managed company based in Bend, Oregon. We serve the Redmond, Simnasho, Sisters, Terrebonne, Three Rivers, Tumalo, Wapinitia, Warm Springs and surrounding areas. Our service is fast, convenient and well priced. Our skills extend to both commercial appliance repair and residential appliance repair. That means that no matter how big or complicated the project is, we will be able to handle it with ease. In fact, we can fix any appliance in your kitchen or laundry room. For example, we do professional refrigerator repair, washer repair, dryer repair, dishwasher repair, stove and range repair, steam oven repair, microwave repair, freezer repair, ice maker repair, barbecue repair, pizza oven repair, patio heater repair and much more. We have a solution for any of those problems. Sometimes it’s something easy like just cleaning out the interior parts and doing some repair work. But often we will need to replace certain parts. Even high-quality modern ovens get some deterioration over time. Our company will order the right parts for you and will make sure they are genuine and high quality. Our company offers convenient appliance maintenance service. This service will allow you to have total peace of mind knowing that your appliances are well taken care of. Our technician will come and do maintenance on your kitchen appliances and washer and dryer several times a year. He will make sure your filters are changed, the internal parts are clean, and everything is in good order. He will catch any problems before they even start. This is perfect service for those that own top class, European and deluxe kitchen appliances. Those appliances are costly and fixing them will cost you quite a bit just in parts. But with our service, you appliances longevity. Oregon Appliance Repair is your best choice for oven repair company. Our experience is extensive. Our technicians are factory trained and certified. They are on top of the latest and greatest in modern appliance technology. When it comes to oven repair our techs will quickly find the best solution for you at very reasonable cost. In addition to this, we have excellent customer service. Your appliance repair appointment will be fast and convenient. Most importantly you will be happy with the results. After an appointment with Oregon Appliance Repair, your oven will be fully functional, clean and safe to use. We guarantee it! For oven repair, please call us at 541-948-8835 or fill out our short contact form. We will be happy to set up a convenient appointment for you. Our friendly and highly skilled licensed technicians will soon be on their way to repair your appliances. We do oven repair Bend, Eugene, Portland, Central Oregon, Crook County, Deschutes County, and Jefferson County. We can help you with all of your oven repair needs. Our company does professional appliance repair on all brands and models of appliances.